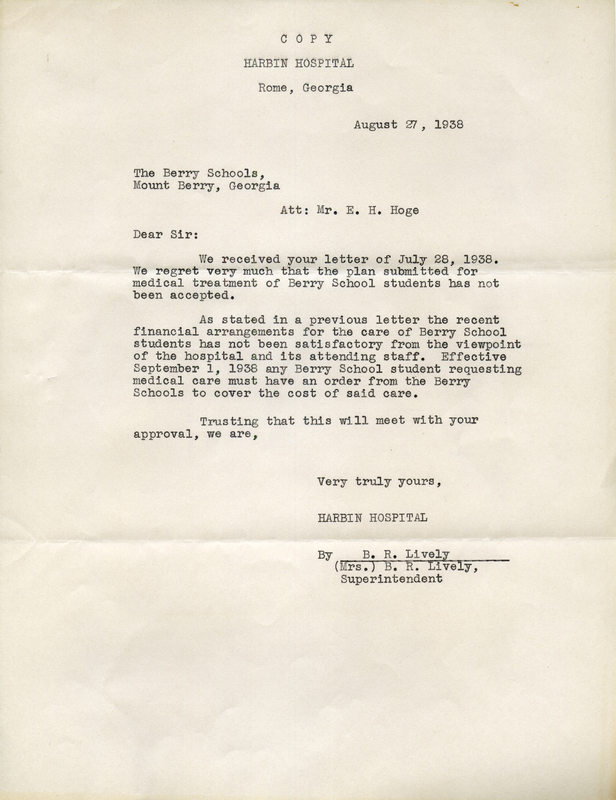 A letter from Harbin Hospital to E. H. Hoge, stating that the plan from the Berry Schools to the Harbin Hospital was not accepted, and that treatment of any student would have to be accompanied by an order from the schools (so that the cost of their aid might be covered). Harbin Hospital, “A Letter from Harbin Hospital to E. H. Hoge.” Martha Berry Digital Archive. Eds. Schlitz, Stephanie A., Justin Karch, Jessica Hornbuckle, et al. Mount Berry: Berry College, 2016. accessed April 26, 2019, https://mbda.berry.edu/items/show/14383.